Proaim Wave-9 40ft Camera Crane Base Package (P-W9P40-BASE). PROAIM welcomes you to the new and modernized era with its huge & sturdy Wave-9 40ft professional camera crane, a perfect filming solution to increase your production value. 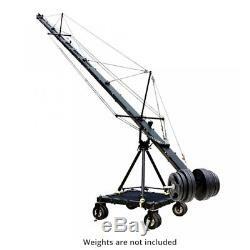 The Robust jib crane is specifically designed for heavy duty setups and high end productions. 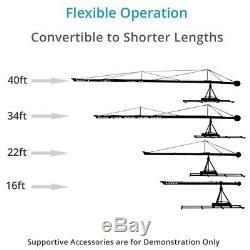 Additionally, the triangle tubing jib crane sections fits smoothly & securely with one another providing super rigidity and strength. The color coded cables ensures quick installation with stability and LCD mounting option enables better viewing possibilities for operator. The counterweight bar accepts standard barbell type weights to maintain the accurate balance. 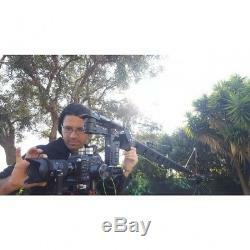 This video production package includes a rugged camera dolly for smooth, dynamic moving shots and rock solid aluminum tripod stand with spreader. WHAT'S IN THE BOX - 40ft Wave 9 Jib crane - Big Heavy Duty Jib Stand (HD-STD-B) - Big Heavy Duty Camera Dolly with floor wheels (HDD-B) - Storage & Packing Cases. "WHAT YOU SEE IS WHAT YOU GET". FEATURES - HIGH STRENGTH Filming Solution for High End Productions - MODULAR DESIGN camera crane transforms into 16ft, 22ft, 25ft, 34ft & 40ft - HEAVY COUNTER BALANCE MECHANISM balances the Jib Crane. ROCK SOLID DOLLY delivers Dynamic Shots. 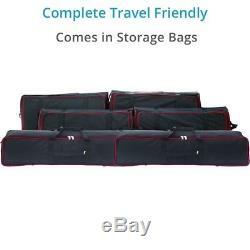 STORAGE CASES are Included for Easy and Secure Transportation. Delivers smoothness that is impossible to reproduce. Jib Arm Break downs to. 13 Sections of jib arms. Each section fits smoothly and securely into another one. For better protection, it is fastened by a screw at the top which ensures better safety of your camera crane. Double security features guarantees its strength and reliability. Custom extruded sections connects smoothly & securely with one another. 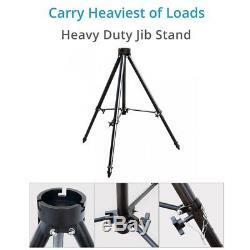 Big Heavy Duty Stand (HD-STD-B). The Heavy duty stand is constructed to carry heaviest of loads with an ease. The Sturdy base ensures strong connection between the jib crane and tripod stand, extra solid knobs for secure locking. 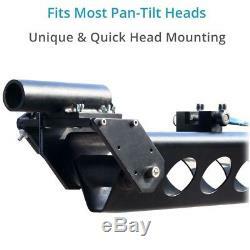 Heavy duty stand ensures steady shots. Rock Solid Heavy duty Jib stand (HD-STD) made of solid aluminum is foundation of Jib Crane. 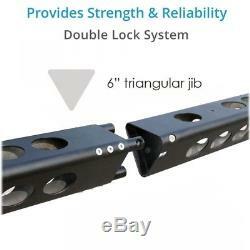 Has double locking system (Aluminum knob and Steel Pin Lock system as well) fully extendable. Big Heavy Duty Dolly (HDD-B). The Aluminum constructed Rock Solid camera dolly gets connected to tripod quickly and features a steering for complete control on directions and rugged stopper for keeping the dolly in static position. 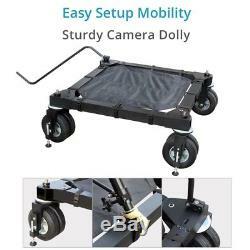 FEATURES - Big Heavy Duty Video Camera Dolly is a 8 Wheeled Heavy Duty Dolly, can bear the total weight up to 600kg (1323lbs). Staring Rod for Changing the Dolly Wheel Direction. Locking system in all four wheels available. Bring a whole new dimension to your videos by moving your camera from a very low shot to a high shot smoothly and efficiently. BIG HEAVY DUTY DOLLY (HDD-B). Modularly designed heavy duty crane transforms into various sizes for different shooting situations. FREE TOOLS AND TOOL POUCH/WRAP. This tool / accessory roll pouch provides Rapid Access to Various Tools such as Allen Keys or wrenches. This premium quality tool roll has 10 Various Pockets to neatly organize a variety of hand tools so you can work quickly and efficiently. TRAVEL WITH EASE & COMFORT. This sophisticated production tool PROAIM 40ft Base Kit comes in its storage configuration for easy transportation. The Supporting accessories are for demonstration purpose. We will try to give our best to our clients. There May be some delay in processing orders placed on weekends. Custom charges are the responsibility of the buyers! Return is accepted within 14 days of receiving the item. Please Dont return the item without informing us. Please send photographs showing damage or any other problem in the product. This will help us both to avoid any type of confusion. Our aim is to Provide Top Level Customer Service, so we will try our best to solve any problem (if any). 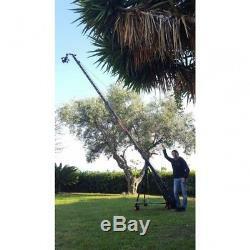 The item "40ft (12m) PROAIM Wave-9 Professional Camera Jib Crane Package Heavy Duty Stand" is in sale since Wednesday, October 11, 2017. This item is in the category "Cameras & Photo\Tripods & Supports\Other Tripods & Supports".shop" and is located in CHANDIGARH, CHANDIGARH.